Where can you find the first 5D attraction in the world? 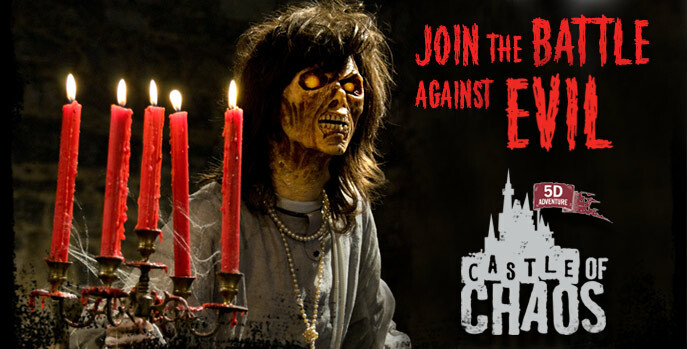 At the Castle of Chaos, part of the Hollywood Wax Museum Entertainment Center! This brand new haunted attraction in Pigeon Forge, TN, combines the experiences of a 3D film, a ride, and a video game in one scary fun adventure. The mission: explore a mysterious Pigeon Forge castle to discover the potential outbreak of paranormal activity. Buckle into your armchair and pick up your pistol as you prepare to see, hear, feel and smell the chaos while shooting for the highest score. Winners are shown on-screen at the end of every haunted ride. The Castle of Chaos in Pigeon Forge was called one the best new attractions in the world by the International Association of Amusement Parks & Attractions. This entry was posted in Attractions and tagged Great Smoky Mountain, Haunted attraction, Hollywood Wax Museum, Pigeon Forge, Pigeon Forge Tennessee, Smoky Mountain, Tennessee. Bookmark the permalink.